I am one of the biggest Colourpop fans and I always get questions about how I get it shipped to the UK as Colourpop do not currently ship to England. I explained it all in this post (link here) and I highly recommend the service I use, I have never had any issues with them and found it to be affordable, if you do have any questions please tweet me. 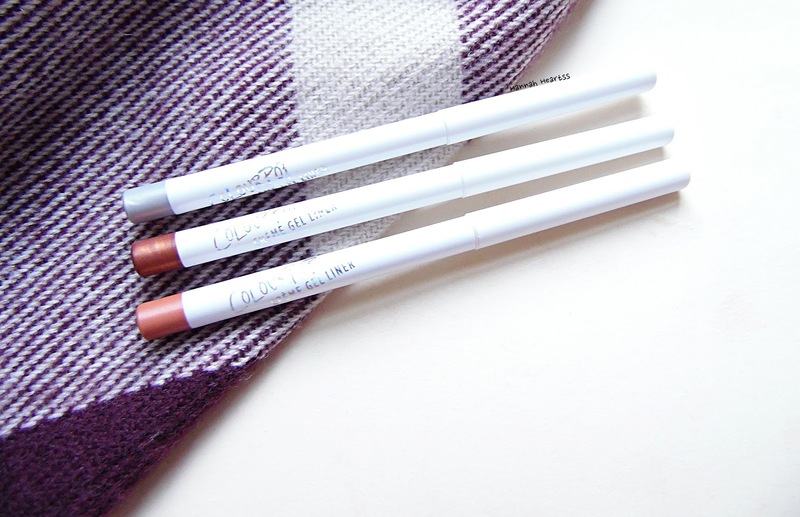 Colourpop recently launched their Crème Gel Liners and Crème Gel Pots and I knew I wanted to get my hands on a couple of the liners. Get Paid, Kicker, Show Me swatched. Colourpop have launched 24 Crème Gel Pots with matching Crème Gel Liners, all of the shades are permanent shades at Colurpop. Each of the Liners are $5 and the Pots for $6 - very affordable. After looking at all of the shades available I settled on three shades to try before purchasing more. 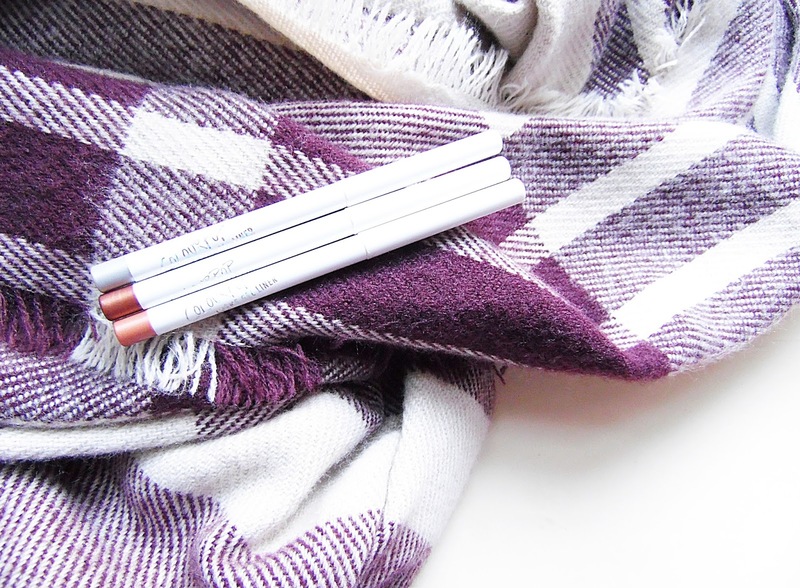 These three shades are the prettiest eyeliners in my collection. The shades I went for were Kicker, Show Me and Get Paid. All three are in the metallic finish, there is two other shades in the metallic finish currently on the Colourpop website. The packaging is very simple with all white packaging with the shade preview on the bottom of each pencil and the writing is in a holographic silver - similar to the Lippie Pencils and Lippie Stixs. The gel liners are twist ups so no need for a sharper. Kicker is a true bright silver, Show Me is gorgeous vivid true copper shade and Get Paid metallic rose gold, this is my favourite shade out of the three. Application with these liners is a dream, they are so creamy and glide on so smooth and easy while leaving comfortable in the waterline or on the lower lash line. These are hands down the best eyeliners I have ever used. They are incredibly creamy and pigmented, as you can see from the swatches - that is just a light swatch! Once you apply the the liners to the waterline, lower lash line or anywhere you prefer they aren't going to budge until you remove it with a makeup remover. These set pretty quickly so you do have to work with them quickly and fix any mistakes or you won't be able to get that perfect liner look. When I say these don't budge, I mean it! 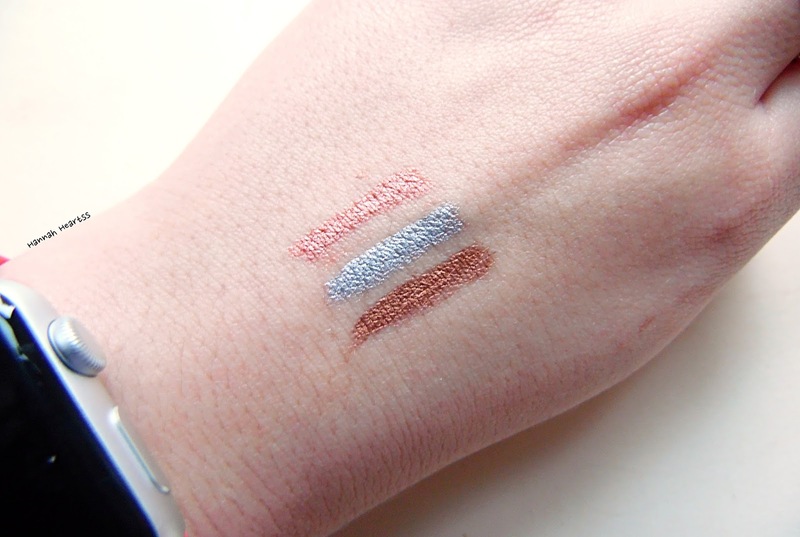 I actually swatched these when they first arrived and I rubbed at them and washed my hands multiple times and they looked still as if I has just swatched them. These liners are so soft so don't twist them up too much as they will break off. I think Kicker is going to be used a lot of over Christmas period, who doesn't want some silver liner?! I am definitely going to pick up more shades, lets be real I am going to end up with every single shade and at $5 they don't break the bank. If you are looking for a liners that are creamy, incredibly pigmented and last all day, you have found them.